Gaston Hippolyte Ambroise Boucart was born on 7 December, 1878 in Angoulême, South West France. 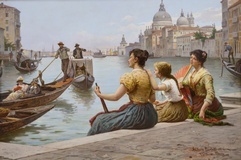 He studied at the Beaux-Arts school of Paris under Gustave Moureau (1826-1898), Aimé Morot (1850-1913), François Flameng (1856-1923) and Fernand Cormon (1845-1924). 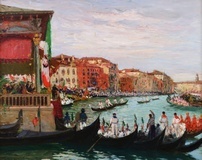 Boucart specialised in painting vividly coloured views of Venice in an impressionistic style. He began exhibiting regularly at the Paris Salon from 1913 and later became a member. He went on to become a member of the French Federation of Artists in 1827 and in 1937 received Chevalier of the Legion d’honneur for his services to art. 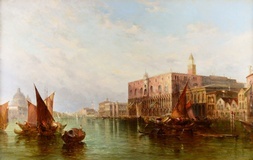 In addition to paintings, he also produced etchings and lithographs. He died on 18 January 1962. A number of his works were acquired by the state. Examples of his works can be found in a number public collections including the museums of Rochefort-sur-Mer , Niort and Angoulême.